Great Gift for Ranchy Peeps or Anyone With a UTV Mia Anstine - Encouraging everyone to get outside, hunt, fish, shoot, and survive life with others in a positive way. A great ranchy gift idea, or one for anyone who drives a 4-wheeler or UTV, has hit my inbox. I once shared this video of ‘What We Grow in Colorado’ (See below). It was all about rocks. We were picking rocks from the pasture before drilling the field. This is an ongoing process. I really do think they must grow because we pick them and then the next year there are more. A cart such as this Half-Ton Hauler would’ve made that process a whole lot easier. You see, we used the Tacoma and had to huck the rocks up in the bed. That wasn’t the bad part. The tough part came when I drove the truck up the side of the hill and then had to unload the rocks. I opened the tailgate and attempted to reverse at a rapid pace and then slam on the brakes, in hopes of the load sliding out. While a few rocks did dislodge, the process did more damage to my brakes than it did at landing rocks on the ground. I don’t suggest that method. The Realtree Half-Ton Hauler has a pivot point, which allows you to tilt the container, without having to utilize every muscle in your body. It’s said to make it easier to drop your load in a designated location. Every ranch should have one of these or at least something like it. While the rocks are picked, for now, I’ve been fixing fence and installing stays. Now I have chunks of wood to pick up. I’m all for giving this one a try. Tell Santa! I’d like to see this one in the driveway with a big red bow attached. Wondering what to get the outdoorsman or woman in your life this Christmas? 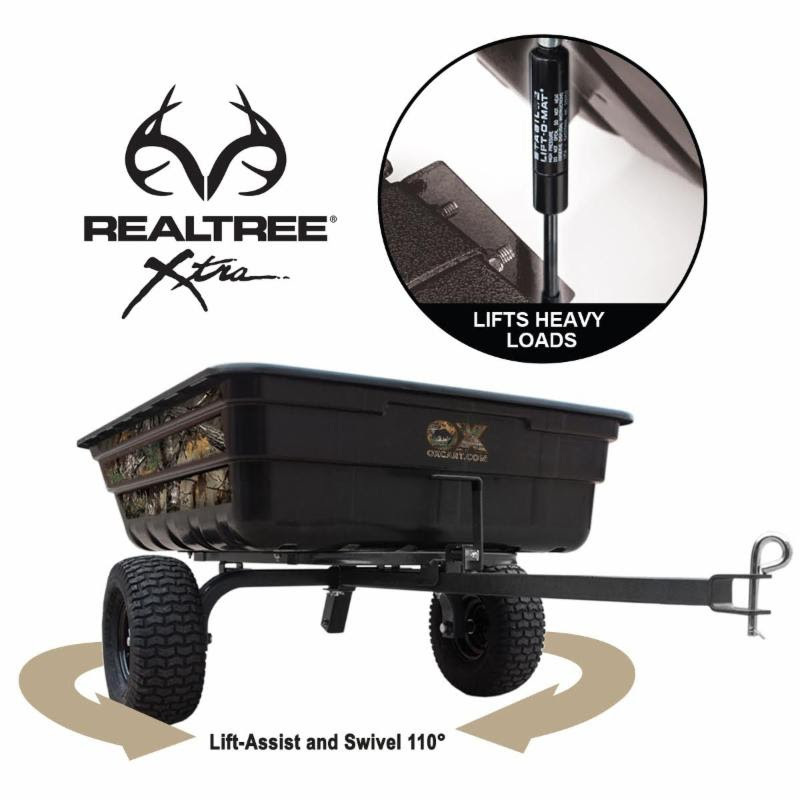 Why not make his or her life a bit easier with the Realtree Half-Ton Hauler Lift-Assist and Swivel Utility Dump Cart by OxCart . Available at Orscheln Farm & Home, TractorSupply.com and Amazon.com, the Half-Ton Hauler may look like an ordinary cart, but it’s far more. In fact, it makes hauling and unloading large loads 90% easier than with standard carts thanks to the offset dump pivot point and hydraulic-assisted tub lift and swivel design. Most utility dump trailers are designed with formed metal frames and a center dump pivot point that cause them to dump like teeter-totters. When the bed is filled with heavy items, you must lift most of the weight to dump the cart. You often have to step away as the load shifts and the tub slams to the ground. The Realtree Half-Ton Hauler’s smart design eliminates these problems. The hauler combines a rear offset dump pivot point for greater control with a hydraulic-assisted tub lift for easier heavy-load handling. The swivel feature reduces backing, allowing you to control dump wherever you want. These key features revolutionize how much you can handle. This smart design saves time and reduces physical strain, allowing you to get more done in half the time and with much less effort. 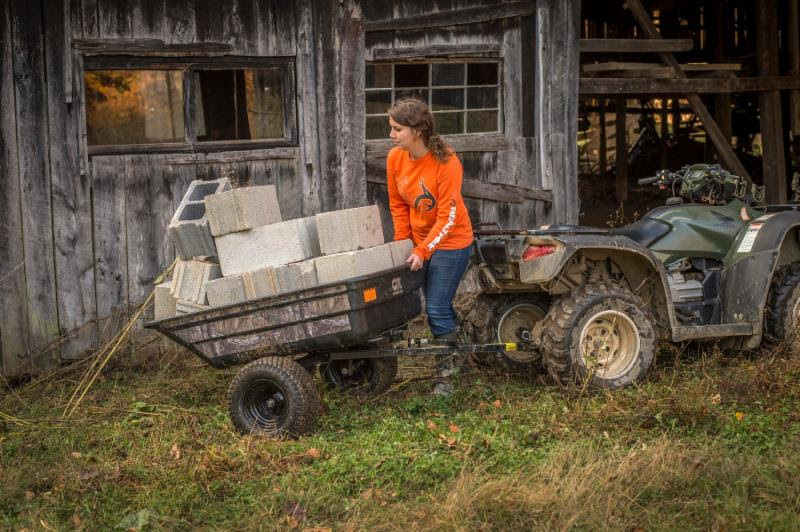 OxCart’s pro-grade performance, innovative design and exclusive features make it the first tow-behind utility dump cart that you can fill to the max knowing it can hold, move, lift, position and dump the heaviest loads with ease. The hauler is load-tested to 1100 pounds, so you can fill it up and make fewer trips. The hauler is designed with professional-grade, all-square-tube steel construction, including NASCAR roll cage full-mandrel designed bent axle support. The powder-coated hammered finish stands up to the wear and tear of the outdoors. Tractor-grade multi-terrain 4-ply tires with run-flat technology are designed with a liquid polymer that self-seals most punctures instantly before losing any air. Commercial-grade graphoil bushings and grease zerks extend the wheel life. 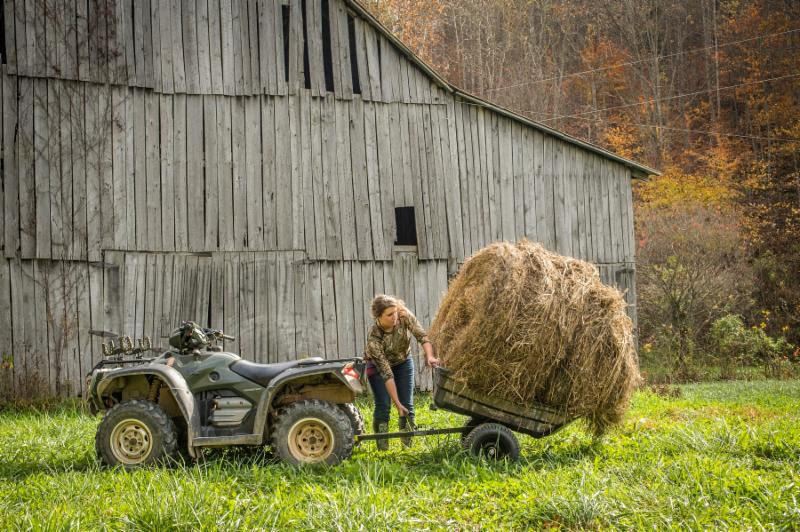 The conversion kit accessory turns the Realtree trailer into a farm cart/wheelbarrow in seconds for use in livestock care, land maintenance and hunting prep.The Realtree Half-Ton Hauler is a perfect Christmas gift for those who manage hunting land or farm land or for those who could use a bit of help around the yard. 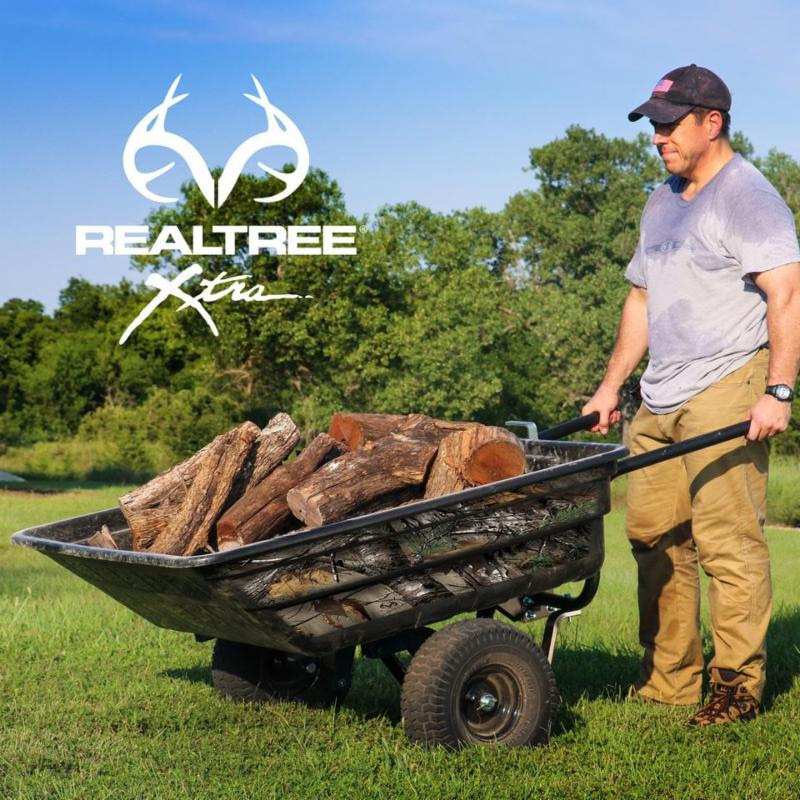 Check out this videoto see how OxCart and the Realtree Half-Ton Hauler work!